The goal of Popular Coin is to ride the tidal wave of popular culture and teach the fundamentals of crypto currencies. Popular Coin’s scrypt algorithm based off the source of Litecoin allows for POP to be mined with the graphics card on your computer. The Development of Popular Coin is based on a play to the socially imprinted words POP and Popular. Popular Coin has 180 second block spacing and 99 coins rewarded per block with extra bonus POP mining rewards along with 5% Yearly average Return On Invesment Minting. Popular Coin promises to remain simple to use and easy to learn. Anyone can easily pick up and understand the Popular Coin technology by visiting the website and using the applications. The Popular Coin wallet will continue to be developed with simple functions so that it is not to overwhelm new users. 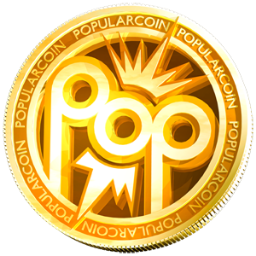 Join the POPCOIN™ Social Forums and Spread the Excitement! Along with Development and Technology, Userbase and Usage help determine the Value of PopularCoin™. Please Visit POP Forums and Join the Discussion to add Your Personal Value into the World of POP! POPCOINs POPNOMICS Social Media That Pays aims to be a place where people can create posts and comments regarding POPCOIN™, Bitcoin, and other Popular Altcoin related topics. The POPCOIN™ POPNOMICs Forum is great for promoting any kind of information that you wish to your online audience, you can even include backlinks and special seo to make sure that your message is the most effective!! The POPCOIN™ Block Chain of Transactions is Open for anyone to View and Verify. The only way that POPCOINs are Generated is by Mining them. The way that POPCOIN™ transactions are processed is by miners connecting their computers with the network and processing the data. When POPCOIN miners process the transaction data every 180 seconds a block of information is generated which is considered one block in the block chain. POPCOIN™ is 100% OpenSource Available for Anyone to View and Make Improvements to the Source Code. POPCOIN™ is an open source software project released under the MIT/X11 license which gives you the power to run, modify, and copy the software and to distribute, at your option, modified copies of the software. The software is released in a transparent process that allows for independent verification of binaries and their corresponding source code. Visit POPNOMICS and Earn POP Every Day, You Can also Visit the POP Exchanges and trade PopularCoins in an array of trading pairs, from bitcoin, litecoin and hundreds of alt coins to almost every fiat currency in the world POP exchanges meet all of your needs in converting to and from PopularCoin™. POPCOIN™ Exchanges also Serve as WebWallets where you can Signup, Login and Get your POP Immediately! All from your SmartPhone, iPad, Laptop or Desktop Computer. © 2014 POPCOIN™ aka Popular Coin™ All Rights Reserved.